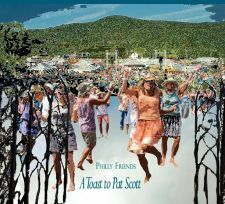 A Toast to Pat Scott" is a 2-song EP in tribute to Pat Scott, whose calm can-do presence and generous volunteer spirit made him a beloved figure in the folk music community. Pat believed actions speak louder than words, and he gave countless hours and valuable expertise to helping produce live acoustic music events in Philadelphia and all over the East coast. Pat also devoted his time and energy to causes he cared about. The one closest to his heart was Women In Transition. All proceeds from the EP go to support Women In Transition (WIT), which provides empowerment counseling, referrals, and advocacy to women in the Philadelphia area who are endangered by domestic violence and / or substance abuse. WIT's programs help women make positive changes in their lives, actualize their potential, and build lives for themsleves and their children that are free of violence and free from addictions to drugs and alcohol. WIT also provides trainings, workshops, and systems advocacy in the community in an effort to build a society that will no longer tolerate violence against woment and children. For more information, to volunteer, and to make a donation, see www.helpwomen.org Thanks to Ginger Osborne for her help and warm support for this project. Oasis Disc Manufacturing lent us a hand, and several members of the Philadelphia Folk community gave their generous support to make this possible. Engineered, mixed, and mastered by Glen Barratt, Morning Star Studios.